The colder weather is well and truly here. I am doing my best to hold on to the warmer months and as a result the brighter nail shades. However, The Manicure Company’s Autumn collection launch is making the transition to the dark side a little less painful. 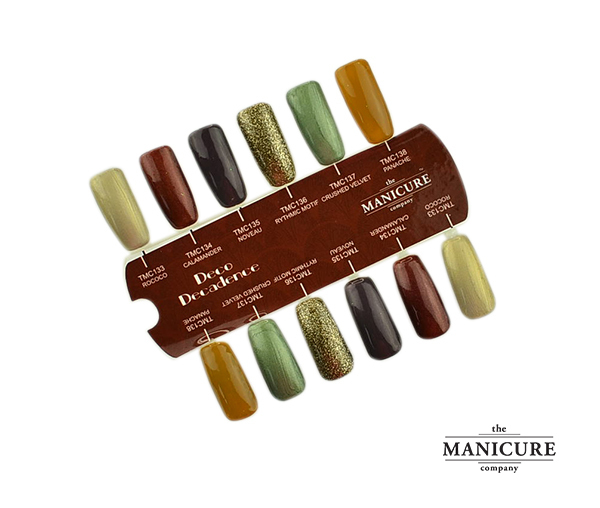 Deco Decadence is a collection of six gel polishes. With one glitter, one cream and 4 metallic/ sheen shades this is definitely something unique to the market. I have heard lots of mixed thoughts on this collection and the only negatives I have heard is the fact that nail techs or clients don’t like metallic shades in general. I have to admit I was a little sceptical myself as I find some shades like this can look dated. However, I bit the bullet and bought the collection. I am happy to say I was wrong to be so sceptical. These shades are actually my favourites from the collection. Not only do they look stunning on the nails but they are so on trend for the coming months. Well done TMC for pushing us out of our comfort zone! As like all other gel polishes from this range, the quality is second to none. I cannot fault any of the shades. They need two coats, possibly three but they hold the same great consistency and longevity as the other polishes from the brand. Rococo is described as a metallic, shell shade with some golden undertones. I can also see some olive green tones peeping through depending on the way the light hits it. Calamander is a metallic shade aswell. This time it is an Auburn shade with a beautiful reddish/wine undertone. This is a super rich, deep shade. Perfect for the Autumn. Nouveau is less metallic than the other shades. This one tends to leans more towards a shimmer shade. The base of this gel polish is a greyish purple with some navy reflect pigments. Rhythmic Motif is the perfect vintage glitter. The dark base and antique gold glitter particles makes this the most luxurious of the collection. Crushed Velvet is probably my favourite shade. This is a hard one to describe but I would say it is a green with silver undertones. It reminds me of the fab crushed velvet furnishing that are out at the moment. This is going to be a big hit. Panache is a the only cream finish in the collection. This is a mix between a rich caramel and mustard shade. It is a stunning shade and as TMC company say, it is a great alternative to the basic nudes. Which one is your favourite? Have you tried this collection yet? Let me know what you think below and don’t forget to rate this collection if you have tried it. The Manicure Company is available to purchase direct from the brand website and various stockists throughout the country. Find you nearest stockist by clicking on this link. For an overview of my thoughts on this brand you can check out my recent post here. Honestly only Calamander calls to me! Not liking the others personally! 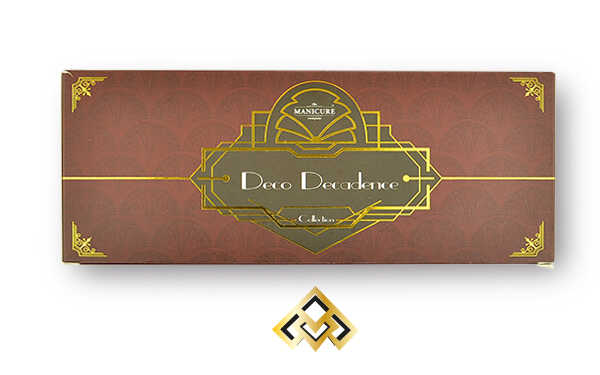 Deco Decadence Collection looks stunning. Crushed Velvet is my favourite shade.